I have self harmed, on and off, since I was fourteen. I have self harmed both before and after coming to faith, and I still struggle with, and often fail to resist, the urge to do it when I am depressed. As you may know, I have written my Guide to Self Injury, covering everything I felt like I wanted to say, earlier in the life of this blog. That included my summary of Christian views of self injury. I had planned to leave it at that, until a conversation on Twitter prompted me to read what I had written again. I didn’t really take enough time, I think, to create a good post on that one – partly because I found writing the Guide so hard that I “triggered” myself completely during that time, and indeed ended up self injuring again, breaking my year on the wagon from it. So, I think that maybe I rushed things. I came to faith in the midst of (mostly) depression. It had gone from feeling a bit down, into being actively suicidal, and I had taken to self harming, cutting on my forearm, several times a day. I was so free of inhibitions at the time that I didn’t really think anything of sitting in a pub with fresh wounds on show, sometimes still bleeding. I felt more out of control than I have ever been, both out of control and in agony. I don’t really know why I was not put in hospital at that time, I certainly think I needed it! Back then, I thought a lot about self harm. I read books on it, I was part of a forum where I talked about it, I wrote poems about it. It went from being something to relieve the pain, to something which became a part of my identity. “I am Emma, and I self harm.” I couldn’t imagine ever stopping, or ever wanting to. I don’t really know how to describe what self injury is to another person who has never done it. I am also aware that words can be used to trigger someone into doing it – there is a song, for instance, which prompts me to hurt myself every single time I listen to it. For me, self injury releases pressure. Sometimes it feels as though the pain and the misery in my head is like a cacophony of sound, a muffling of sense and reason, an unbearable pressure and an agitation that makes me just want to do something – anything. I feel frightened of my self, frightened that I might hurt someone else, that I might kill myself, it feels to me as though I have totally lost control. It is at the moment when I feel like I might just fly apart, that I hurt myself. The pain – I know it is pain, but it doesn’t feel like the pain I get if I accidentally cut myself – breaks through the clouds in my head, and makes everything come into focus. This may make no sense to anyone but me but it feels as though a cool breeze has just come into the room, as though my eyes see better, and as though a weight has been lifted from my neck. I can breathe again. The pressure has gone, for a while. When I came to faith, I knew only that I had a Friend. I didn’t think about the complicated questions very much, the great “why” of suffering, nor did I think about what my self harm might mean to God. To be honest, my brain wasn’t working very well back then, and I just clung to Christ, and had faith, had trust – it was as though I had nothing else, no part of the me I once knew was there, I was just holding to Someone in the darkness. All this is a rather long preamble to the question at the heart of this entry – is self injury a sin? Really the answer is, it depends on what you mean by sin. Self injury is not, obviously, a good thing. I cannot believe that God likes the fact that his children hurt themselves out of misery and pain. I believe that the Lord wants us to be happy, that he hurts when we hurt, and that the sight of us hurting ourselves fills him with compassion and not with holy anger. To me, there is sin that is deliberate – if we steal something, for instance – something which we seek out, knowing it is wrong and deciding to do it anyway. Then there is sin which is not deliberate, where we are not trying to disobey God or man, we are merely in a situation where we feel there is no choice. Catholic moralists (on whom I am not an expert) make a distinction between stealing out of starvation and stealing for profit, as they do between mortal (serious, wilful violation of God’s law) and venial (slight, perhaps not fully intending to do it). To me, self injury is something we shouldn’t be doing – but it is not something we have full control over doing, it is something that I do only in distress, and not out of any intention to distress anyone, man or God. In the end I would say that you can describe self injury as a sin, but it would be better to describe it as a bad coping mechanism, something not to be condemned as a crime, but looked at with compassion. It helps no one to go to someone who is in pain and tell them that the only way they have found of easing that pain is making God angry, that he hates what they are doing. I believe God understands, and while he doesn’t want us to hurt ourselves, I think he understands that sometimes, we cannot think of another way to ease the burden we are shouldering. He understands that pain can sometimes help us escape another sort of pain, and he, who bore pain on the cross, wishes our pain to end – the pain of depression, or mental illness, or whatever reason we have for self harming – it is that that he wants to end, because if you end that, then the self harm will end too. 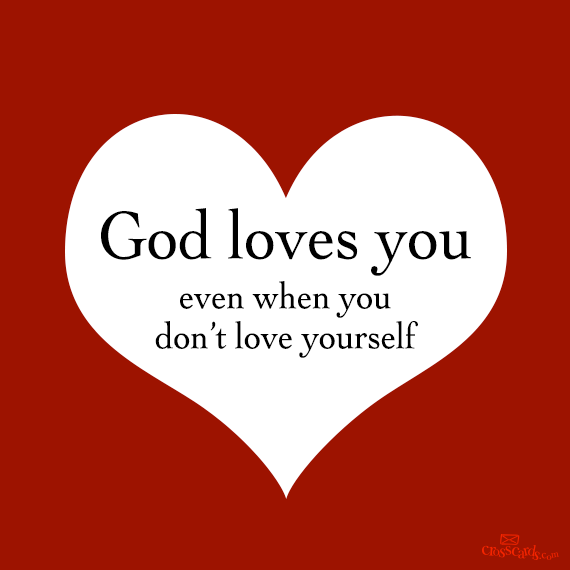 God does not condemn us for self harm – but he issues a challenge to all of us, ill or not, self harming or not, to look after one another and seek to remove the root of self harm, rather than concentrating on the branches. What a moving post, Emma. Thank you. It strikes me that self injury might be like some of the desperate prayers in the Psalms. Not nice, but honest expressions of the heart.